A woman involved in a car crash ended up with an unusual side effect after she developed an infection and was treated with antibiotics. We need to warn you, the image in this story may be disturbing. A 55-year-old woman involved in a car crash ended up with an unusual side effect after she developed an infection and was treated with antibiotics. Researchers say she developed a "black hairy tongue." The New England Journal of Medicine shared two photos. The first one shows the woman's blackened tongue. You can see it below. 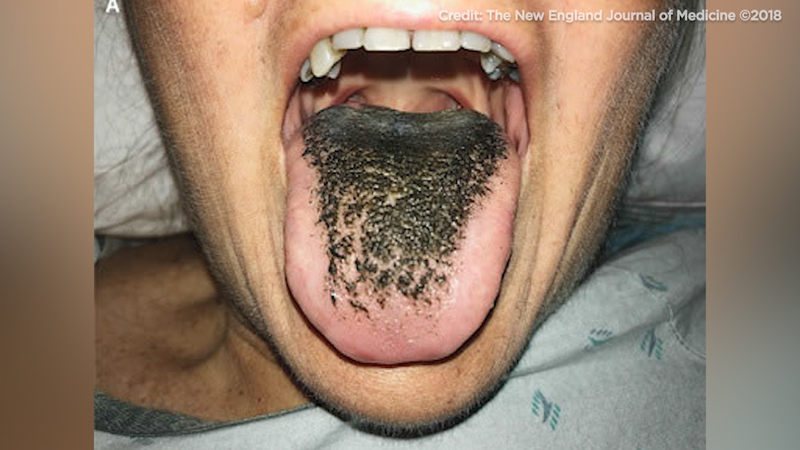 This image shows a woman's blackened tongue. The second photo shows what her tongue looked like when it returned to normal. Researchers say several things can cause black hairy tongue, including poor oral hygiene, the use of tobacco or irritating mouthwashes and antibiotic treatments, particularly tetracyclines. In the case of the woman in the photos, researchers say she was treated with two antibiotics, including minocycline and meropenem. She is doing much better now, researchers say within four weeks after the minocycline was stopped, her tongue returned to its normal color. Here's more information about the woman's condition from the New England Journal of Medicine.